One out of every ten veterans alive today was seriously injured at some point while serving in the military, and three-quarters of those injuries occurred in combat. For many of these 2.2 million wounded warriors, the physical and emotional consequences of their wounds have endured long after they left the military, according to a Pew Research Center survey of a nationally representative sample of 1,853 veterans conducted from July 18 to Sept. 4, 2011. Veterans who suffered major service-related injuries are more than twice as likely as their more fortunate comrades to say they had difficulties readjusting to civilian life. They are almost three times as likely as other veterans to report they have suffered from post-traumatic stress (PTS). And they are less likely in later life to be in overall good health or to hold full-time jobs. The survey also finds that injured veterans are the most likely to say that they are not getting enough assistance from the government. Fully half (52%) of all veterans badly injured while serving say the government has not given them, as a veteran, “all the help you think it should.” In contrast, of other veterans, only 32% are as critical of the government, while 63% say it has done enough to assist them. Overall, seven-in-ten injured veterans1 rate the care that wounded soldiers receive in U.S. military hospitals as “excellent” or “good.” But this judgment varies dramatically by the era in which the veteran served. Among those who left the military prior to the decade of war that began just after the terrorist attacks of Sept. 11, 2001, seven-in-ten injured veterans (71%) rated medical care positively—a view shared by only 55% of those badly injured who served after 9/11. 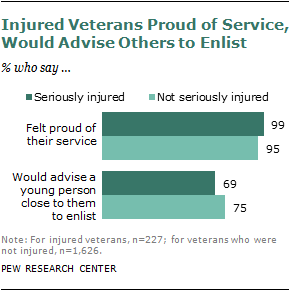 At the same time, nearly all veterans are proud of their service, regardless of whether they suffered serious injuries. And more than seven-in-ten say they would advise a young person close to them to enlist. While the decade since 9/11 constitutes the longest period of continuous fighting in the nation’s history, the largest share of today’s wounded warriors served during another era: the Vietnam War. About a third (33%) of all injured veterans served during the Vietnam era (1964-73). In comparison, 18% have served in the post-9/11 era, about the same as the share of surviving veterans of World War II and Korean War. About a quarter (26%) served between 1974 and Sept. 11, 2001, a period that includes the 1990-91 Gulf War. Whether in war or peace, the military is a dangerous profession, and longer service brings greater risk of serious injury. According to the survey, those who served 10 years or more are twice as likely as those who served two years or less to suffer a service-related serious injury (16% vs. 7%). Enlisted men and women are about as likely as officers to be badly hurt during their military careers (11% for officers and 8% for enlisted), as were 13% of noncommissioned officers, a group that includes sergeants, corporals, petty officers and warrant officers. To fill out the portrait of wounded warriors, this report also relies on a data source with a much larger sample of injured veterans than our own national survey. In July 2010, the Census Bureau re-interviewed 9,739 veterans who had been questioned the previous year as part of the bureau’s monthly Current Population Survey (CPS). The sample included 1,058 veterans who are partially or fully disabled as a result of a service-related injury or condition and had received an official disability rating2 from the Department of Defense or Department of Veterans Affairs. According to the CPS survey, women and minorities are somewhat more likely than whites or men to be disabled. Among the service branches, a larger proportion of Marines are disabled (17%) than veterans who served in the Army (14%), Air Force (14%) or Navy (12%). And veterans who served in combat are three times as likely to be disabled as those who did not (24% vs. 8%). Census data also confirm Pew survey findings that show the difficulties that injured or disabled veterans face in the labor force. The remainder of this report is organized in the following manner. The first section provides a more detailed analysis of the distinctive ways that injured and uninjured veterans view their lives, their military service and their country. It also examines the negative impact of a service-related injury on employment and long-term health. The second section focuses on the differences in attitudes and experiences of injured and uninjured veterans who have served in the post-9/11 era. It also reports on the differences between these two groups on survey questions about their re-entry into civilian life that were asked of veterans who served during that time. The final section presents a more detailed demographic portrait of disabled veterans and is based on an analysis of data from the July 2010 CPS Military Supplement survey. Included in this group were 227 veterans who said that they were seriously injured while in the military and that their injuries were service-related. An additional 1,619 veterans sustained no injuries or injuries that were not serious. Seven veterans declined to answer the question. The margin of sampling error for results based on the entire sample of veterans is plus or minus 3.5 percentage points at the 95% level of confidence; the margin of sampling error for the pre-9/11 sample is plus or minus 3.9 percentage points; and the margin of sampling error for those who served after 9/11 is plus or minus 5.7 percentage points. The margin of sampling error is plus or minus 9.8 percentage points for the injured veteran sample and 3.7 percentage points for the sample of uninjured veterans. Veterans were interviewed by telephone or via the internet. A total of 1,639 interviews were conducted over the telephone under the direction of Social Science Research Solutions (SSRS). Respondents had been identified as veterans in earlier surveys conducted by SSRS and the Pew Research Center and were re-contacted for the veterans survey. Of the total sample, 1,307 telephone interviews were conducted on landline telephones and 332 on cell phones. Interviewing for the telephone survey was conducted from July 18 to Sept. 4, 2011. These interviews were supplemented by 214 interviews with veterans who served after 9/11 and are part of random sample panel of households maintained by the research firm Knowledge Networks. These online interviews were conducted Aug. 18-31, 2011. The two data sets were combined and the entire sample weighted by SSRS to match known demographic characteristics of the veterans population as reported by the U.S. Census Bureau. In addition, the post-9/11 oversample was weighted back to reflect its correct proportion of the overall veteran population.